The jars are lovely, solid, seem to keep food fresh for longer ( I put leftovers in some of them) and look great! They came very well packaged which made me very sure that I would buy from them again. Classic jars that really do the job. These jars are AMAZING. They are the perfect size for making instant noodle soup bowls and for storing leftovers or for bringing a salad to work in. Absolutely love these jars. They are a bit pricier than mason jars, but I love the fact that glass is the only thing that touches the food inside. The seal is nice and tight and they are extremely versatile. I highly recommend them. Beautiful, but a little harder to use than I thought they'd be. Everything looks fabulous in them. I use them to displace to go options in the Grab and Go fridge in my restaurant Table 6 in Portland Oregon. I plan to buy smaller ones for canning fruit, salsa and salad dressings to go when we expand to brunch this summer. I like that you don't need to buy metal lids any longer and they are glass I like the shape and size of the jars. I had a hard time using the jars until I figured it out they came with no instructions and so it was just a matter of not knowing on my part. Now that I have figured out how to use them its all good. but the price is a lot more than the reg. canning jars. I just love these. I use them for spices, skincare products I make, to make my own sour cream (which is insanely easy and these jars are prefect to store it).A tip - you can often find these for pretty cheap at Home Goods! I really like using the glass instead of plastic. And the rubber gasket snugs the lid totally air tight: I’ve been making homemade vegan puddings and the glass storage is making a difference in keeping the texture as well as the freshness for over 5 days. I’m in love. I chose these for their looks, I admit it. I don't do canning or make jams or molds, I just like to store foods (and make Overnight Oats) in pretty jars with airtight lids. These Weck half-liter mold jars meet my needs.The only reason for docking one star is to make clear that the clips which hold the lid on are not attached to the jars. I knew this going in--I am not disappointed--but it's a huge NOPE for some people. When you open the jar, there are two small metal parts just lying around separately, to be lost. They're easy-on and easy-off, but you do need them to re-close the jar properly.If you buy a set of these attractive jars, it might not be a bad idea to have a little handy spot in your kitchen where you store the clips. products were well packaged to protect in transit and are easy to store and use. Very helpful that the clips fit all size jars. I am really glad that I have found a reliable supplier of Weck jars. There is a real benefit in using Weck over other preserving jars because of their unique attributes. Weck's variety of sizes, variety of shapes, unique glass and rubber seals, plastic reseal and heavy glass ensure that preserved foods are stored hygienically before and after opening. 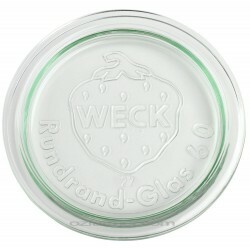 The fact that Weck jars have no shoulder or lip ensure that contents remain uncontaminated before and after preserving. For example, screw top jars can trap contents particles after opening. Weck make excellent products that are worth their price. Beautiful jar and so useful too. I bought it to interchange with the fermenting lid and will make ferments however there are many options for this size jar. I love the shape and design. 1 litre (actual capacity 1062ml) Weck Preserving Tulip Jar. Suits large lid and seal (optional). Choose either the option of purchasing the single jar or the jar complete with glass lid, natural rubber seal and 2 stainless steel clips. Weck reusable glass jars are of the highest quality and contain NO BPA! (Bisphenol A). The most versatile and beautiful preserving jar available today. **Also available in packs of 6 with lids. Weck canning jars are made with thick glass to withstand boiling, sterilizing and processing over and over again. Glass lids preclude issues with rusting, and the tab on the replaceable rubber ring, when facing downwards, indicates clearly that the seal on the jar is intact. All jars have wide openings for tidy, easy filling. 1/5 litre / 290ml Tall Weck Heavy Duty Preserving Mold Jar.Weck reusable Glass Jars are of the h..
290ml Weck Tapered Jar (Short)- Single290ml Weck Preserving round tapered jar (short version). ..
580ml / 1/2 litre Weck Preserving round tapered jar. Takes Large lid and seal. Choose either t..
850ml Weck Tapered Jar - Single850ml / 3/4 litre Weck Preserving round tapered jar. Takes Large..
140ml Weck Heavy Duty preserving Jar. These are a perfect size for yoghurts, kefir drinks and baked ..
370ml Weck Tapered Jar - Single 741370ml Weck Preserving Round Tapered Jar. 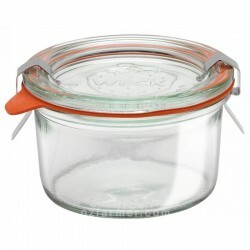 Takes Large lid and..
580ml Weck Tulip Jar - Single1/2 litre / 580ml capacity Weck Preserving Tulip Jar. Takes Large..
1/5 litre (actual volume 370ml) Weck Tulip Jar - SingleTakes medium lid and seal.Choose eit..
Weck reusable Glass Jars are of the highest quality and contain NO BPA! (Bisphenol A).These jars.. The 370ml Rex jar is a universally useful jar. From compote to paperclips - it can practically be .. These weights are actually Weck reusable Glass Lids. Made of the highest quality glass, they contai.. Plastic Sprout Lid to fit Wide Mouth Mason Jar BPA FREE ​Easy to use and great for beginners. Th..
6 x 1 litre Weck Juice Jar - 766 - includes glass lids, seals and clamps1 litre (exact capacity..